The 3/8" - 3/4" long potter wasp females don't gather mud for their nests. They first collect water and then mix it with dry soil using their mandibles. The mud mixture is transported to the nest-making site where it is fashioned into individual pots ranging in size from 1/4" - 6/16" in diameter. The entire construction process may require hundreds of trips over several hours. The wasp belongs to the family Vespidae, which includes paper wasps, yellowjackets, and hornets. 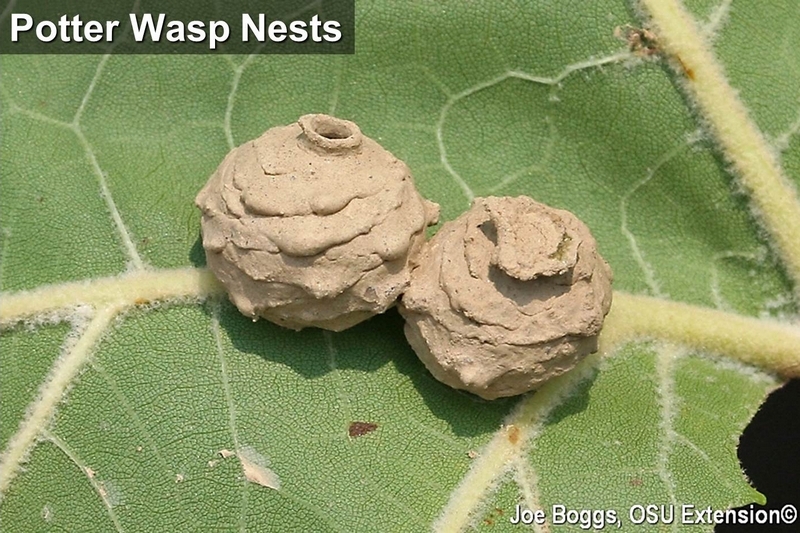 Of course, potter wasps create their nesting artistry using clay rather than paper. As the pot nears completion, the female lays a single egg attached by a thread to the inside surface of the nest. They then provision the pot with a caterpillar or beetle larva that has been paralyzed by a sting. Once provisioned, the pot is sealed with a clay plug leaving the hapless paralyzed prey to await the wasp's hatchling larva. Thus, potter wasps are considered beneficial … to all but their prey!